Note: Neither the Republic of China nor the People's Republic of China were invited to the San Francisco Peace Conference, and neither were parties to the San Francisco Treaty. The Republic of China concluded a separate Treaty of Peace with Japan in 1952. Prime Minister Yoshida Shigeru of Japan, surrounded by senior members of the Japanese delegation, signs the peace treaty on 8 September 1951. (a) The state of war between Japan and each of the Allied Powers is terminated as from the date on which the present Treaty comes into force between Japan and the Allied Power concerned as provided for in Article 23. (b) Japan renounces all right, title and claim to Formosa and the Pescadores. (c) Japan renounces all right, title and claim to the Kurile Islands, and to that portion of Sakhalin and the islands adjacent to it over which Japan acquired sovereignty as a consequence of the Treaty of Portsmouth of 5 September 1905. (d) Japan renounces all right, title and claim in connection with the League of Nations Mandate System, and accepts the action of the United Nations Security Council of 2 April 1947, extending the trusteeship system to the Pacific Islands formerly under mandate to Japan. (e) Japan renounces all claim to any right or title to or interest in connection with any part of the Antarctic area, whether deriving from the activities of Japanese nationals or otherwise. (f) Japan renounces all right, title and claim to the Spratly Islands and to the Paracel Islands. Japan will concur in any proposal of the United States to the United Nations to place under its trusteeship system, with the United States as the sole administering authority, Nansei Shoto south of 29deg. north latitude (including the Ryukyu Islands and the Daito Islands), Nanpo Shoto south of Sofu Gan (including the Bonin Islands, Rosario Island and the Volcano Islands) and Parece Vela and Marcus Island. Pending the making of such a proposal and affirmative action thereon, the United States will have the right to exercise all and any powers of administration, legislation and jurisdiction over the territory and inhabitants of these islands, including their territorial waters. (b) Japan recognizes the validity of dispositions of property of Japan and Japanese nationals made by or pursuant to directives of the United States Military Government in any of the areas referred to in Articles 2 and 3. (c) Japanese owned submarine cables connection Japan with territory removed from Japanese control pursuant to the present Treaty shall be equally divided, Japan retaining the Japanese terminal and adjoining half of the cable, and the detached territory the remainder of the cable and connecting terminal facilities. (iii) to give the United Nations every assistance in any action it takes in accordance with the Charter and to refrain from giving assistance to any State against which the United Nations may take preventive or enforcement action. 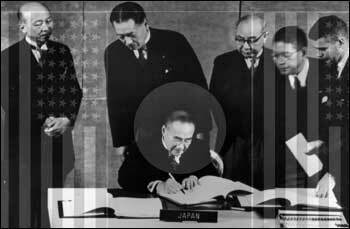 (b) The Allied Powers confirm that they will be guided by the principles of Article 2 of the Charter of the United Nations in their relations with Japan. (c) The Allied Powers for their part recognize that Japan as a sovereign nation possesses the inherent right of individual or collective self-defense referred to in Article 51 of the Charter of the United Nations and that Japan may voluntarily enter into collective security arrangements. (a) All occupation forces of the Allied Powers shall be withdrawn from Japan as soon as possible after the coming into force of the present Treaty, and in any case not later than 90 days thereafter. Nothing in this provision shall, however, prevent the stationing or retention of foreign armed forces in Japanese territory under or in consequence of any bilateral or multilateral agreements which have been or may be made between one or more of the Allied Powers, on the one hand, and Japan on the other. (b) The provisions of Article 9 of the Potsdam Proclamation of 26 July 1945, dealing with the return of Japanese military forces to their homes, to the extent not already completed, will be carried out. (c) All Japanese property for which compensation has not already been paid, which was supplied for the use of the occupation forces and which remains in the possession of those forces at the time of the coming into force of the present Treaty, shall be returned to the Japanese Government within the same 90 days unless other arrangements are made by mutual agreement. (a) Each of the Allied Powers, within one year after the present Treaty has come into force between it and Japan, will notify Japan which of its prewar bilateral treaties or conventions with Japan it wishes to continue in force or revive, and any treaties or conventions so notified shall continue in force or by revived subject only to such amendments as may be necessary to ensure conformity with the present Treaty. The treaties and conventions so notified shall be considered as having been continued in force or revived three months after the date of notification and shall be registered with the Secretariat of the United Nations. All such treaties and conventions as to which Japan is not so notified shall be regarded as abrogated. (b) Any notification made under paragraph (a) of this Article may except from the operation or revival of a treaty or convention any territory for the international relations of which the notifying Power is responsible, until three months after the date on which notice is given to Japan that such exception shall cease to apply. (a) Japan will recognize the full force of all treaties now or hereafter concluded by the Allied Powers for terminating the state of war initiated on 1 September 1939, as well as any other arrangements by the Allied Powers for or in connection with the restoration of peace. Japan also accepts the arrangements made for terminating the former League of Nations and Permanent Court of International Justice. (b) Japan renounces all such rights and interests as it may derive from being a signatory power of the Conventions of St. Germain-en-Laye of 10 September 1919, and the Straits Agreement of Montreux of 20 July 1936, and from Article 16 of the Treaty of Peace with Turkey signed at Lausanne on 24 July 1923. (c) Japan renounces all rights, title and interests acquired under, and is discharged from all obligations resulting from, the Agreement between Germany and the Creditor Powers of 20 January 1930 and its Annexes, including the Trust Agreement, dated 17 May 1930, the Convention of 20 January 1930, respecting the Bank for International Settlements; and the Statutes of the Bank for International Settlements. Japan will notify to the Ministry of Foreign Affairs in Paris within six months of the first coming into force of the present Treaty its renunciation of the rights, title and interests referred to in this paragraph. Japan will enter promptly into negotiations with the Allied Powers so desiring for the conclusion of bilateral and multilateral agreements providing for the regulation or limitation of fishing and the conservation and development of fisheries on the high seas. Japan renounces all special rights and interests in China, including all benefits and privileges resulting from the provisions of the final Protocol signed at Peking on 7 September 1901, and all annexes, notes and documents supplementary thereto, and agrees to the abrogation in respect to Japan of the said protocol, annexes, notes and documents. Japan accepts the judgments of the International Military Tribunal for the Far East and of other Allied War Crimes Courts both within and outside Japan, and will carry out the sentences imposed thereby upon Japanese nationals imprisoned in Japan. The power to grant clemency, to reduce sentences and to parole with respect to such prisoners may not be exercised except on the decision of the Government or Governments which imposed the sentence in each instance, and on recommendation of Japan. In the case of persons sentenced by the International Military Tribunal for the Far East, such power may not be exercised except on the decision of a majority of the Governments represented on the Tribunal, and on the recommendation of Japan. (a) Japan declares its readiness promptly to enter into negotiations for the conclusion with each of the Allied Powers of treaties or agreements to place their trading, maritime and other commercial relations on a stable and friendly basis. (2) ensure that external purchases and sales of Japanese state trading enterprises shall be based solely on commercial considerations. (c) In respect to any matter, however, Japan shall be obliged to accord to an Allied Power national treatment, or most-favored-nation treatment, only to the extent that the Allied Power concerned accords Japan national treatment or most-favored-nation treatment, as the case may be, in respect of the same matter. The reciprocity envisaged in the foregoing sentence shall be determined, in the case of products, vessels and juridical entities of, and persons domiciled in, any non-metropolitan territory of an Allied Power, and in the case of juridical entities of, and persons domiciled in, any state or province of an Allied Power having a federal government, by reference to the treatment accorded to Japan in such territory, state or province. (d) In the application of this Article, a discriminatory measure shall not be considered to derogate from the grant of national or most-favored-nation treatment, as the case may be, if such measure is based on an exception customarily provided for in the commercial treaties of the party applying it, or on the need to safeguard that party's external financial position or balance of payments (except in respect to shiping and navigation), or on the need to maintain its essential security interests, and provided such measure is proportionate to the circumstances and not applied in an arbitrary or unreasonable manner. (e) Japan's obligations under this Article shall not be affected by the exercise of any Allied rights under Article 14 of the present Treaty; nor shall the provisions of this Article be understood as limiting the undertakings assumed by Japan by virtue of Article 15 of the Treaty. (a) Japan will enter into negotiations with any of the Allied Powers, promptly upon the request of such Power or Powers, for the conclusion of bilateral or multilateral agreements relating to international civil air transport. (b) Pending the conclusion of such agreement or agreements, Japan will, during a period of four years from the first coming into force of the present Treaty, extend to such Power treatment not less favorable with respect to air-traffic rights and privileges than those exercised by any such Powers at the date of such coming into force, and will accord complete equality of opportunity in respect to the operation and development of air services. (c) Pending its becoming a party to the Convention on International Civil Aviation in accordance with Article 93 thereof, Japan will give effect to the provisions of that Convention applicable to the international navigation of aircraft, and will give effect to the standards, practices and procedures adopted as annexes to the Convention in accordance with the terms of the Convention. (a) It is recognized that Japan should pay reparations to the Allied Powers for the damage and suffering caused by it during the war. Nevertheless it is also recognized that the resources of Japan are not presently sufficient, if it is to maintain a viable economy, to make complete reparation for all such damage and suffering and at the same time meet its other obligations. 1. Japan will promptly enter into negotiations with Allied Powers so desiring, whose present territories were occupied by Japanese forces and damaged by Japan, with a view to assisting to compensate those countries for the cost of repairing the damage done, by making available the services of the Japanese people in production, salvaging and other work for the Allied Powers in question. Such arrangements shall avoid the imposition of additional liabilities on other Allied Powers, and, where the manufacturing of raw materials is called for, they shall be supplied by the Allied Powers in question, so as not to throw any foreign exchange burden upon Japan. which on the first coming into force of the present Treaty were subject to its jurisdiction. The property, rights and interests specified in this subparagraph shall include those now blocked, vested or in the possession or under the control of enemy property authorities of Allied Powers, which belong to, or were held or managed on behalf of, any of the persons or entities mentioned in (a), (b) or (c) above at the time such assets came under the controls of such authorities. (v) obligations of Japan or Japanese nationals, any right, title or interest in tangible property located in Japan, interests in enterprises organized under the laws of Japan, or any paper evidence thereof; provided that this exception shall only apply to obligations of Japan and its nationals expressed in Japanese currency. (III) Property referred to in exceptions (i) through (v) above shall be returned subject to reasonable expenses for its preservation and administration. If any such property has been liquidated the proceeds shall be returned instead. (IV) The right to seize, retain, liquidate or otherwise dispose of property as provided in subparagraph (I) above shall be exercised in accordance with the laws of the Allied Power concerned, and the owner shall have only such rights as may be given him by those laws. (V) The Allied Powers agree to deal with Japanese trademarks and literary and artistic property rights on a basis as favorable to Japan as circumstances ruling in each country will permit. (b) Except as otherwise provided in the present Treaty, the Allied Powers waive all reparations claims of the Allied Powers, other claims of the Allied Powers and their nationals arising out of any actions taken by Japan and its nationals in the course of the prosecution of the war, and claims of the Allied Powers for direct military costs of occupation. (a) Upon application made within nine months of the coming into force of the present Treaty between Japan and the Allied Power concerned, Japan will, within six months of the date of such application, return the property, tangible and intangible, and all rights or interests of any kind in Japan of each Allied Power and its nationals which was within Japan at any time between 7 December 1941 and 2 September 1945, unless the owner has freely disposed thereof without duress or fraud. Such property shall be returned free of all encumbrances and charges to which it may have become subject because of the war, and without any charges for its return. Property whose return is not applied for by or on behalf of the owner or by his Government within the prescribed period may be disposed of by the Japanese Government as it may determine. In cases where such property was within Japan on 7 December 1941, and cannot be returned or has suffered injury or damage as a result of the war, compensation will be made on terms not less favorable than the terms provided in the draft Allied Powers Property Compensation Law approved by the Japanese Cabinet on 13 July 1951. (b) With respect to industrial property rights impaired during the war, Japan will continue to accord to the Allied Powers and their nationals benefits no less than those heretofore accorded by Cabinet Orders No. 309 effective 1 September 1949, No. 12 effective 28 January 1950, and No. 9 effective 1 February 1950, all as now amended, provided such nationals have applied for such benefits within the time limits prescribed therein. (c) (i) Japan acknowledges that the literary and artistic property rights which existed in Japan on 6 December 1941, in respect to the published and unpublished works of the Allied Powers and their nationals have continued in force since that date, and recognizes those rights which have arisen, or but for the war would have arisen, in Japan since that date, by the operation of any conventions and agreements to which Japan was a party on that date, irrespective of whether or not such conventions or agreements were abrogated or suspended upon or since the outbreak of war by the domestic law of Japan or of the Allied Power concerned. (ii) Without the need for application by the proprietor of the right and without the payment of any fee or compliance with any other formality, the period from 7 December 1941 until the coming into force of the present Treaty between Japan and the Allied Power concerned shall be excluded from the running of the normal term of such rights; and such period, with an additional period of six months, shall be excluded from the time within which a literary work must be translated into Japanese in order to obtain translating rights in Japan. (a) Upon the request of any of the Allied Powers, the Japanese Government shall review and revise in conformity with international law any decision or order of the Japanese Prize Courts in cases involving ownership rights of nationals of that Allied Power and shall supply copies of all documents comprising the records of these cases, including the decisions taken and orders issued. In any case in which such review or revision shows that restoration is due, the provisions of Article 15 shall apply to the property concerned. (b) The Japanese Government shall take the necessary measures to enable nationals of any of the Allied Powers at any time within one year from the coming into force of the present Treaty between Japan and the Allied Power concerned to submit to the appropriate Japanese authorities for review any judgment given by a Japanese court between 7 December 1941 and such coming into force, in any proceedings in which any such national was unable to make adequate presentation of his case either as plaintiff or defendant. The Japanese Government shall provide that, where the national has suffered injury by reason of any such judgment, he shall be restored in the position in which he was before the judgment was given or shall be afforded such relief as may be just and equitable in the circumstances. (a) It is recognized that the intervention of the state of war has not affected the obligation to pay pecuniary debts arising out of obligations and contracts (including those in respect of bonds) which existed and rights which were acquired before the existence of a state of war, and which are due by the Government or nationals of Japan to the Government or nationals of one of the Allied Powers, or are due by the Government or nationals of one of the Allied Powers to the Government or nationals of Japan. The intervention of a state of war shall equally not be regarded as affecting the obligation to consider on their merits claims for loss or damage to property or for personal injury or death which arose before the existence of a state of war, and which may be presented or re-presented by the Government of one of the Allied Powers to the Government of Japan, or by the Government of Japan to any of the Governments of the Allied Powers. The provisions of this paragraph are without prejudice to the rights conferred by Article 14. (b) Japan affirms its liability for the prewar external debt of the Japanese State and for debts of corporate bodies subsequently declared to be liabilities of the Japanese State, and expresses its intention to enter into negotiations at an early date with its creditors with respect to the resumption of payments on those debts; to encourage negotiations in respect to other prewar claims and obligations; and to facilitate the transfer of sums accordingly. (a) Japan waives all claims of Japan and its nationals against the Allied Powers and their nationals arising out of the war or out of actions taken because of the existence of a state of war, and waives all claims arising from the presence, operations or actions of forces or authorities of any of the Allied Powers in Japanese territory prior to the coming into force of the present Treaty. (b) The foregoing waiver includes any claims arising out of actions taken by any of the Allied Powers with respect to Japanese ships between 1 September 1939 and the coming into force of the present Treaty, as well as any claims and debts arising in respect to Japanese prisoners of war and civilian internees in the hands of the Allied Powers, but does not include Japanese claims specificially recognized in the laws of any Allied Power enacted since 2 September 1945. (c) Subject to reciprocal renunciation, the Japanese Government also renounces all claims (including debts) against Germany and German nationals on behalf of the Japanese Government and Japanese nationals, including intergovernmental claims and claims for loss or damage sustained during the war, but excepting (a) claims in respect of contracts entered into and rights acquired before 1 September 1939, and (b) claims arising out of trade and financial relations between Japan and Germany after 2 September 1945. Such renunciation shall not prejudice actions taken in accordance with Articles 16 and 20 of the present Treaty. (d) Japan recognizes the validity of all acts and omissions done during the period of occupation under or in consequence of directives of the occupation authorities or authorized by Japanese law at that time, and will take no action subjecting Allied nationals to civil or criminal liability arising out of such acts or omissions. Japan will take all necessary measures to ensure such disposition of German assets in Japan as has been or may be determined by those powers entitled under the Protocol of the proceedings of the Berlin Conference of 1945 to dispose of those assets, and pending the final disposition of such assets will be responsible for the conservation and administration thereof. Notwithstanding the provisions of Article 25 of the present Treaty, China shall be entitled to the benefits of Articles 10 and 14(a)2; and Korea to the benefits of Articles 2, 4, 9 and 12 of the present Treaty. If in the opinion of any Party to the present Treaty there has arisen a dispute concerning the interpretation or execution of the Treaty, which is not settled by reference to a special claims tribunal or by other agreed means, the dispute shall, at the request of any party thereto, be referred for decision to the International Court of Justice. Japan and those Allied Powers which are not already parties to the Statute of the International Court of Justice will deposit with the Registrar of the Court, at the time of their respective ratifications of the present Treaty, and in conformity with the resolution of the United Nations Security Council, dated 15 October 1946, a general declaration accepting the jurisdiction, without special agreement, of the Court generally in respect to all disputes of the character referred to in this Article. (a) The present Treaty shall be ratified by the States which sign it, including Japan, and will come into force for all the States which have then ratified it, when instruments of ratification have been deposited by Japan and by a majority, including the United States of America as the principal occupying Power, of the following States, namely Australia, Canada, Ceylon, France, Indonesia, the Kingdom of the Netherlands, New Zealand, Pakistan, the Republic of the Philippines, the United Kingdom of Great Britain and Northern Ireland, and the United States of America. The present Treaty shall come into force of each State which subsequently ratifies it, on the date of the deposit of its instrument of ratification. (b) If the Treaty has not come into force within nine months after the date of the deposit of Japan's ratification, any State which has ratified it may bring the Treaty into force between itself and Japan by a notification to that effect given to the Governments of Japan and the United States of America not later than three years after the date of deposit of Japan's ratification. All instruments of ratification shall be deposited with the Government of the United States of America which will notify all the signatory States of each such deposit, of the date of the coming into force of the Treaty under paragraph (a) of Article 23, and of any notifications made under paragraph (b) of Article 23. For the purposes of the present Treaty the Allied Powers shall be the States at war with Japan, or any State which previously formed a part of the territory of a State named in Article 23, provided that in each case the State concerned has signed and ratified the Treaty. Subject to the provisions of Article 21, the present Treaty shall not confer any rights, titles or benefits on any State which is not an Allied Power as herein defined; nor shall any right, title or interest of Japan be deemed to be diminished or prejudiced by any provision of the Treaty in favour of a State which is not an Allied Power as so defined. Japan will be prepared to conclude with any State which signed or adhered to the United Nations Declaration of 1 January 1942, and which is at war with Japan, or with any State which previously formed a part of the territory of a State named in Article 23, which is not a signatory of the present Treaty, a bilateral Treaty of Peace on the same or substantially the same terms as are provided for in the present Treaty, but this obligation on the part of Japan will expire three years after the first coming into force of the present Treaty. Should Japan make a peace settlement or war claims settlement with any State granting that State greater advantages than those provided by the present Treaty, those same advantages shall be extended to the parties to the present Treaty. The present Treaty shall be deposited in the archives of the Government of the United States of America which shall furnish each signatory State with a certified copy thereof. IN FAITH WHEREOF the undersigned Plenipotentiaries have signed the present Treaty. DONE at the city of San Francisco this eighth day of September 1951, in the English, French, and Spanish languages, all being equally authentic, and in the Japanese language. Source: United Nations Treaty Series 1952 (reg. no. 1832), vol. 136, pp. 45 - 164.